You call it biting, but your pussycat may believe she's just playing. Your beloved pussycat is sweet and gentle most of the time, but she can turn into a biting terror from hell. 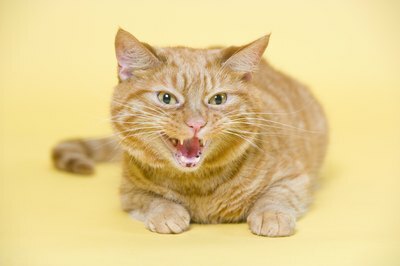 Despite the kitty's possible playful intentions, her aggressive biting can be frightening and can cause possible injury to you and other family members. Biting and scratching usually start as play behavior in kittens; but unless you curtail such behavior, the young feline may carry this aggressive behavior into adulthood. Take your feisty feline to a veterinarian for a full medical checkup, the ASPCA urges. Tests will eliminate the possibility of a serious health condition that could be causing aggression and increased irritability, such as undetected wounds, physical pain, distress from mites or fleas, hormonal imbalance, orthopedic problems, adrenal dysfunction, cognitive dysfunction, sensory deficits and neurological disorders. Biting in older cats can stem from insecurity and confusion. Diet and certain medications can also alter mood and make a usually calm cat more prone to aggressive behavior. When your normally gentle kitty suddenly decides to use one of your body parts for lunch, loudly say "ouch" or "no," even if the bite didn't hurt -- don't scream, which may upset the cat and cause her to bite again. Gently pull your hand or arm from her mouth, if that's the area being chomped on. Don't yank it away, or the cat will think the game is still on and continue biting. Consider how you may be contributing to Fluffy's aggressive tendencies. Alter your own behavior if it's upsetting her, recommends the ASPCA. Stop constantly picking her up if she bites you during those moments and allow her to come to you when she's ready. Perhaps she doesn't like to be overly handled and petted, and although you love her to death, you're being too affectionate for your independent cat. The next time your mild-mannered pussycat changes into a ferocious biting lion, grasp her by the scruff of the neck, gently push her face to the ground and say "no" in a loud and firm tone of voice. Keep the cat in this position for a few seconds and then let her go, which will teach her that biting is wrong. This is how mother cats discipline their kitties for misbehavior. Play with your pussycat for at least 20 minutes each day. Try to divert her attention away from your hands and feet, the most common biting spots, and give her interactive cat toys to focus on instead. Schedule these play dates when your kitty seems the most energetic and playful. Many times, playful biting of feet or hands happens when felines are bored and simply looking for some play action and companionship. Each time you finish playing with your pussycat and she remains the sweet ball of fluff that you fell in love with, give her positive reinforcement by rewarding her with a little treat, such as her favorite food. Your kitty's no fool. Eventually she'll realize that biting doesn't bring her any satisfactory rewards. Leave the room whenever your kitty bites you, recommends the ASPCA. By walking away, you're showing your furry friend that she'll lose her play companion each time she sinks her teeth into your flesh. Punishing the kitty by sending her out of the room may provoke her to continue biting, so it's best to remove yourself from the situation instead. Repeatedly giving a bite-happy tabby these time-outs during playtime will send her an effective message of the consequences of aggressive behavior and compel her to stop. Never punish a cat by hitting her nose, yelling or smacking her, which can make the biting problem worse, according to the ASPCA.